It’s cute, but does it have pockets?? As I’ve gotten older, there have been many advancements in the management of type 1 diabetes. However, I’ve also noticed a correlation between technological advancements and how much stuff I have to carry around with me. 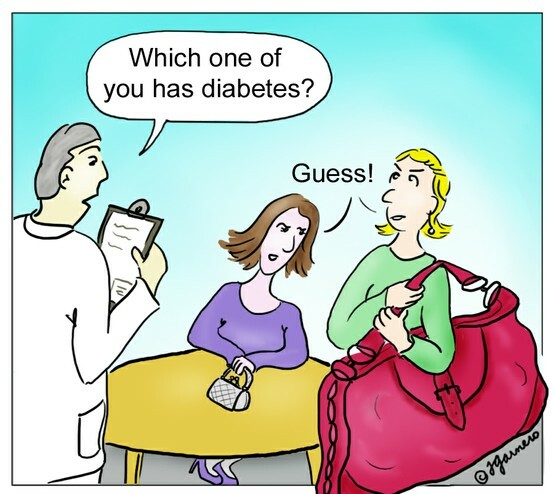 When I was first diagnosed, I had an insulin vile, syringe and my glucose meter. Simple enough. A year later, I switched from injections to an insulin pump, a device that literally is always by your side. Next came the continuous glucose monitor, a monitor that takes a reading every few minutes and graphs trends in blood glucose over time. Since it uses a wireless signal, it can’t be more than a few feet away, meaning it’s another device to carry around. And let’s not forget about always having something on you to treat a low blood sugar. For me, these are packets of fruit snacks. Luckily being a woman, I can shove most of it in a purse, but it does get to be cumbersome. And that’s just for my diabetes. Throw in my wallet, keys, and cellphone and I’ve already got a pretty packed purse. I sincerely hope that these medical device companies follow in the footsteps of companies like Apple, and continue to make their products slimmer, lighter, and smaller. Or better yet, make one device that does it all! My shoulder and back would be very grateful. Pockets are another big thing. When I first got my insulin pump, a year after being diagnosed, I was still self-conscious and did not want it to show. I kept the pump in my pocket and the cord tucked away. When it was clipped to my pants, I was constantly asked if it was a pager, to which my initial response was always, “I’m 14, why would I need a pager? ?” Eventually though, I saw this question as an opportunity to teach people about diabetes and what an insulin pump does. I discovered that most people were just curious and were interested in hearing about it. Today I’m not concerned if my pump shows or not, although I still prefer pockets. I’ve also learned to not be self-conscious about all the different things attached to my stomach, especially at the beach or pool. Between my infusion set and wireless sensor, things can start to feel a little crowded, in addition to being a bit unusual looking. Rather than feeling uncomfortable, I’ve learned to view it as a conversation starter. Granted not many random people ever stop me to ask what they are, but if they did, I’d be ready! It’s not always easy finding ways to incorporate an external device into your life. While I’ve been fortunate to not have dropped it in any body of water, I’ve come across other unpleasant situations. One that particularly stands out is when the cord of my pump got wrapped around a knob of a drawer, yanking the infusion site out of my body as I walked the other way. Incorporating these devices also involves being creative from time to time, especially when figuring out how to wear an insulin pump with skirts and dresses. But where there is a will, there’s a way.